In July 2011 — two and a half years ago! — I started working on my first quilt. I saw a link somewhere to the We Can Do It! Skill Builder Sampler quiltalong being hosted by Leila of Sewn By Leila and decided mostly on impulse that I was going to learn to quilt. I’d read up on it a little bit before that, but I hadn’t quite gotten over the intimidation factor. So I made a couple of blocks, then stopped for a while. Months and months later, I made a few more blocks, then stalled out again. Last January, I became determined to make this quilt already. I started again, being more careful not to strain my neck with lousy ergonomics, which was most of my problem before. (I have some neck problems, and the way I was setting up to do rotary cutting initially was making my neck super unhappy.) Things were going much better once I figured out how not to ruin myself in the process, and I started making two or three blocks a week. Then I came to the second-to-last block, and I froze up. I was fine until I looked at the picture and thought, “Huh, I wonder how many pieces are in that thing.” Answer: 97. Somehow knowing that freaked me right out, and I procrastinated. A lot. I also had a ton of other projects I wanted to work on, so it was easy to put it off. In November, I finally got over myself and made that block. It was nowhere near as hard as I’d made it out to be in my head, so all the fearcrastination was for nothing. 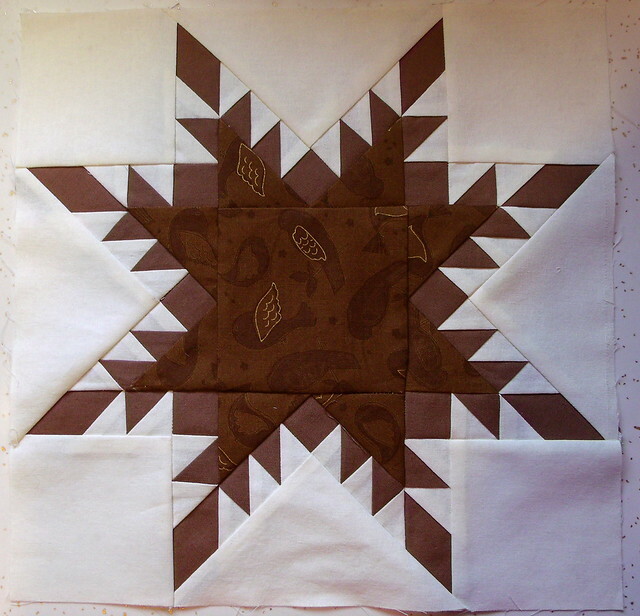 The sampler tutorial shows the feathered star being done with regular piecing, but there’s also a follow-up post with a link to the paper piecing templates that Marlene of Kissed Quilts made, and I decided to go with the paper pieced version. The templates are great, and it went pretty well. I did goof somewhere assembling the whole thing and had one inset seam to do at the end (there should have just been partial seams, but I think I put it together in the wrong order). Little bit of puckering where the inset seam is, but otherwise not bad. Which I’m completely okay with. I considered trying to reshape the wings, but in the end I decided to just trim them. My official position is that it’s, um, too magnificent to be constrained within the confines of a 12″ square! Yeah, that! So now I’m in the midst of putting the top together. I finally feel like I’m making a quilt instead of making a pile of quilt blocks! Which feels pretty awesome. 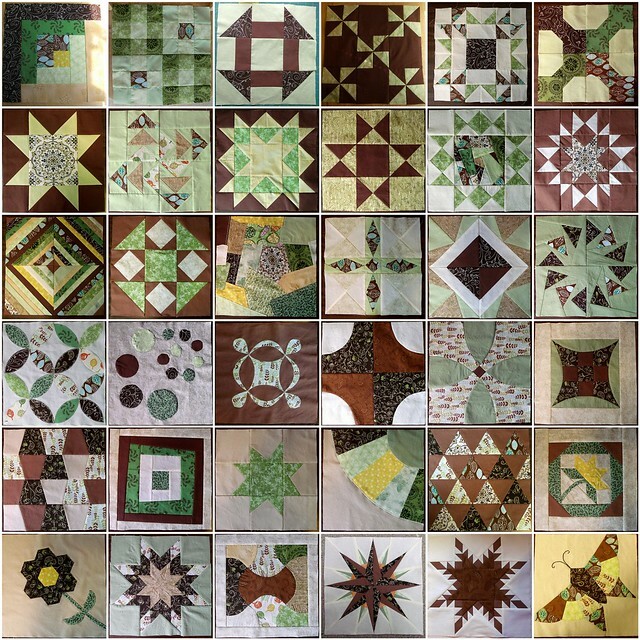 It’s no longer my first quilt — the Project Hope quilt ended up being the first one finished. But it’s my first bed-sized quilt, and it was a pretty massive undertaking. I learned so much doing this. 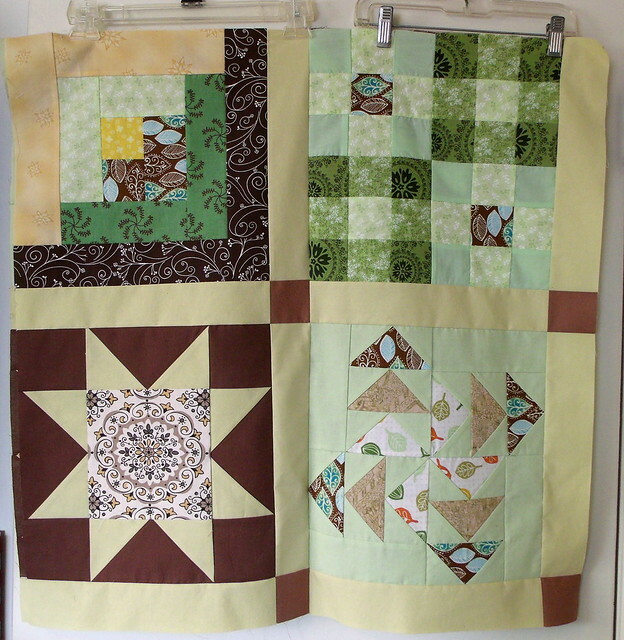 I’ve been finding Jaye’s post on putting quilt tops together in chunks incredibly helpful. I would’ve started putting long rows together automatically if I hadn’t read that, and I was a little nervous about sewing a ton of long seams. So far I’ve got about four chunks like this done. I have a vacation day from work and am planning on holing up indoors to stay out of the insanely cold weather and working on the quilt all day — woohoo! it’s beautiful, although I love quilts, I am intimidated by them, I love your colour scheme. Thank you! 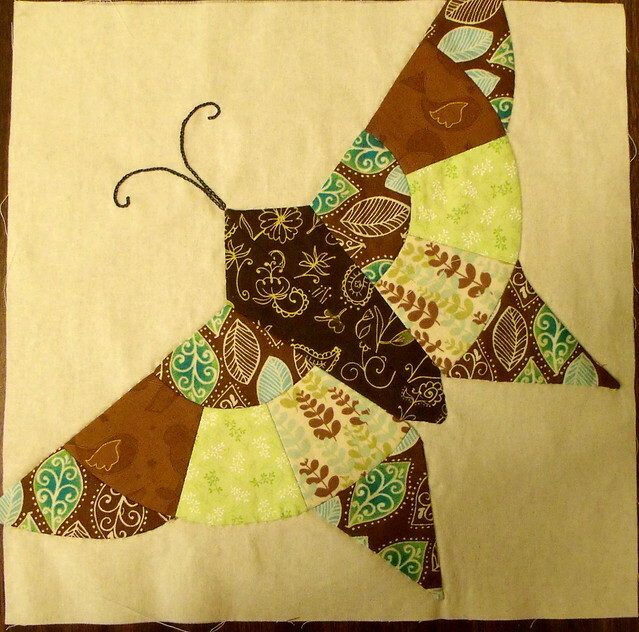 I was really intimidated by quilting before I started, too. It all looked so complicated and fiddly. The skill builder sampler tutorials I used (linked in the post) were really excellent. It started out easy, with lots of info before starting and only rectangles in the first block, and it gradually built up skills so that I was pretty much always completely ready for the next thing. The only time I got really nervous about trying anything was that second to last block, which turned out to be nowhere near as hard as I thought it would be.